We have a fantastic range food hygiene training related resources including a fun quiz to test your food hygiene knowledge, FAQ for any questions you have and much more. Test your knowledge with our fun quiz, the questions featured here are similar in style and difficulty to the ones in the actual test. So if you’re ready, let’s go. Find out about your legal obligations and why you must have suitable food hygiene training if you handle food. Find out what you can expect during an Inspection from the Environmental Health officer and how you can comply with food safety law. Stay informed; get the latest news and information on food hygiene safety from our team of expert authors. 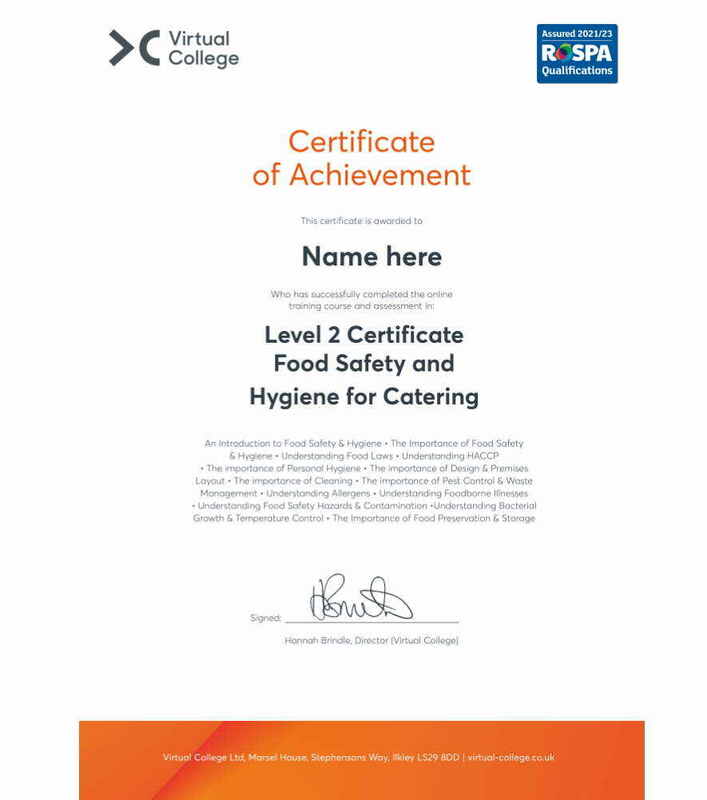 Upon completion of the online training material learners will sit an online test and on successful completion, learners will receive a certificate in food safety and hygiene. Depending on which type of certificate has been purchased, certificates will be either downloaded from within the Learning Management System and self-printed by the learner or if completed successfully Monday-Friday before 12:00 midnight, certificate will be posted next day. Weekend completers will have their certificates posted on Monday. Our certificates are extremely high quality with an authorisation seal. The training and test usually take between 2 to 3 hours to complete (depending on learning speed) which is equivalent to 6 hours face to face group training. Learners are required to achieve a 75% pass mark, and, if necessary, may attempt the test 3 times at no extra cost, having revisited the training material. If learners have not achieved the 75% pass mark, further attempts may be given by contacting Learner Support. On average this course contributes 2-3 hours towards your CPD.